I have installed Gnome 3 on Ubuntu today following this guide. All worked well and I have installed the extensions mentioned without problem. However, after logging out and in, all extensions were gone. Going to the Gnome extensions website, I saw that all my extensions were outdated and that I could install only one other extension. I'm rather new to Ubuntu and completely new to Gnome. I don't even know how to check my own version (there's no mention of Gnome in System Information) - I reasoned maybe I'm using an outdated version, even though apt-get update/upgrade/dist-upgrade does not upgrade anything or solves the problem. How do I get things back working? I've uninstalled all my extensions, but that didn't do the trick, either. Update: I tried to install the one extension the gnome website shows as valid, but nothing happens; same when trying to install 'outdated' extensions. I see the popup, choose install, nothing happens. If you have installed GNOME 3 from above mentioned page repository, you most probably selected the Quantal repository or you are using Ubuntu Quantal under development release. As per mentioned gnome-shell version 3.5.4 you are actually using a newer version yet to be released in stable repository for Ubuntu 12.04 Precise. You are most probably using Ubuntu Quantal quetzal gnome-shell package . Since currently in active development , no extensions are being ported or developed for 3.5.4 unstable release . My guess, wait for stable release ought to be announced as 3.6 in October later this year and consequently in Ubuntu Official stable source. Remember that 3.5.x is a development release and it should NOT be installed on production machines. It is intended to be used for testing purposes only. 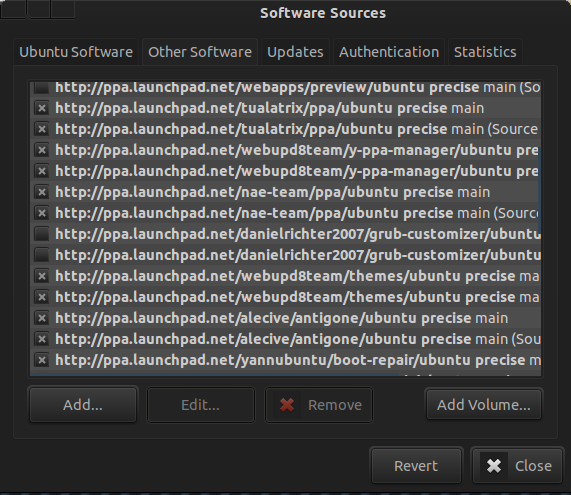 To remove the Gnome 3 PPA open software sources from Dash or through update manager in settings menu , then go to as image and remove or delete the gnome 3 ppa listings manually ( i don't have it :P ). Then do sudo apt-get update && sudo apt-get upgrade and install gnome shell as above command. Then you should be able to go into gnome extensions and install the new versions. I think there is some issue with properly being able to download and replace other older versions (especially if they were installed through other PPAs. Partial distro upgrade causes gnome-shell-extensions to be incompatible?